The word Asthma comes from the Greek verb aazein, meaning to pant, to exhale with the open mouth, sharp breath. In The Iliad, a Greek epic poem (attributed to Homer) describing the siege of Troy, the expression asthma appeared for the first time.Asthma was seen as a psychosomatic ailmentat the start of the 20th century, a tactic that possiblyfaded any medical advances at the time. Asthma was recognized as one of the sacred seven psychosomatic diseases during the 1930s to 1950s.Until the 1960s, when anti-inflammatory medications started being used, Asthma as an inflammatory disease was not really accepted. 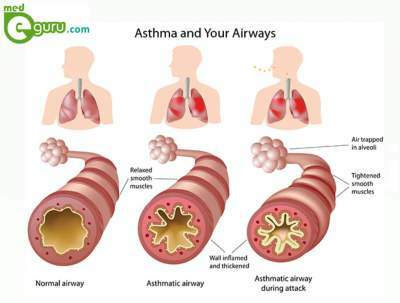 Asthma is a disease which affects the airways that transmit air to and from the lungs. Asthmatic are the people who suffer from this chronic condition said to be.The inside walls of an asthmatic’s airways are swollen or inflamed. Due to this swelling or inflammation the airways are exceedingly subtle to irritations which make and increase your susceptibility to an allergic reaction.Less air can pass through them, both to and from the lungs as inflammation causes narrow airways.Narrowingsymptoms include wheezing, chest tightness, breathing problems, and coughing. Asthmatics usually experience these symptoms most recurrently during the night and the early morning. The airway linings swollen or inflamed. Productionof large amounts of mucus that is thicker than normal. Become narrower because of muscle contractions surrounding the airways. Frequent coughing, mainly at night. Wheezing (a whistling noise during breathing). History of allergies (allergic asthma). Smokers living in the household. The simple reply to this query is, YES, an inclination to develop asthma is inherited. If one of your biological parents has or had asthma, then you are more susceptible to grow asthma than if he or she did not have asthma. If both of your parents have asthma, you are even more likely to develop asthma than if only one parent has this condition. Asthma like many other diseaseresults, in part from an affinity, present in one’s genes, towards developing the disease and in part from exposures that one comes upon in the world around him/her: i.e., Part heredity, part environment. Precisely what in our environment enhances to develop asthma in those with a genetic tendency is unknown. It may involve breathed particles to which we are allergic, cigarette smoke or air pollution, viruses or other germs, or some mix of these and possibly other factors.